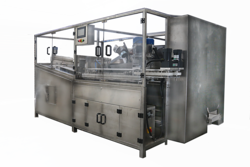 Prominent & Leading Manufacturer from Ahmedabad, we offer automatic bottle conveyor for fmcg industry. By following along with the business sector advancement, we are included in offering Automatic Bottle Conveyor for Pharmaceutical Industry. Our offered conveyor are composed utilizing high review crude material and heading engineering in adherence with business sector standards. Our clients can profit these conveyor from us in different modified choices. Likewise, we offer our whole scope of conveyor in distinctive details.